This piece of ours has been around for a long time. I first made the turquoise suits back in 2014 and the idea had been kicking around in my head for years before that. The ideas had initially been focused on the image – a turquoise figure in the landscape, an anomaly – and, somehow, that never felt enough to go ahead and make the thing. But as John and I began to work more closely, collaborating to bring art and music together, the blue suit re-emerged. We were living in a remote island community in Scotland and looking at the ways that we try to connect to place, the human yearning to form meaningful connection to where we are. We thought about how we, as an artist and a musician, could seek that connection. We both have suits (although mine has yet to properly find its niche) and in 2014/15 we spent the summers seeking connection with Orkney. I life model – which is a favourite way of connecting with people, vulnerable, intimate, silent – so I decided to cut some shapes. For John, it had to be jazz, so he used his trumpet to improvise his way to connection. 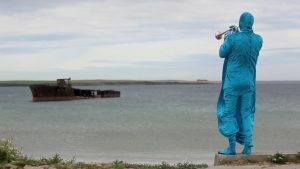 The working title for the piece was initially In, On With not Of, reflecting our outsider or incomer status in Orkney. There’s a video of the piece from 2014 here. ‘My Jazz Suit’. 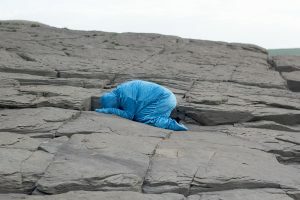 Although the work leans heavily on the Pathos of an individual, encased in a ridiculous shiny nylon outfit, striving to connect with the landscape and with place, John (ironically) reports that he does find a connection while he’s playing. He took to calling his suit ‘My Jazz Suit’ and it stuck. And now we’re back down in Central Scotland. A different place – more buildings, more people, less seals, less birds. 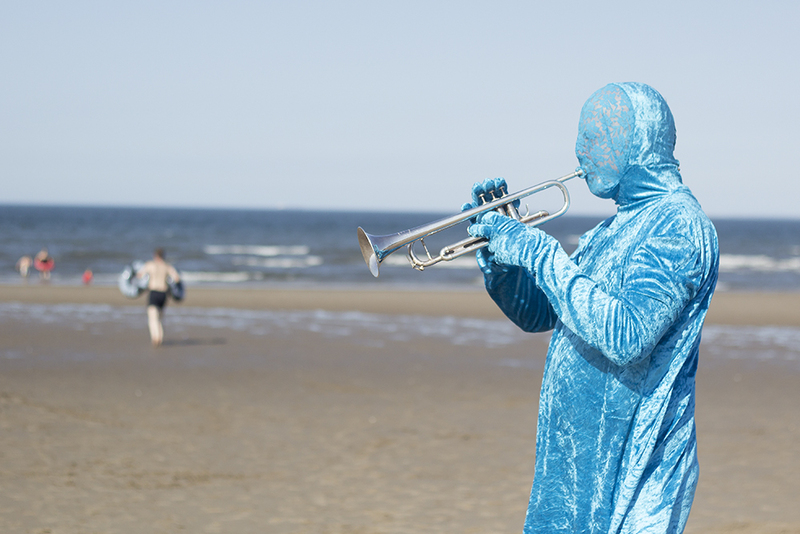 This week we took The Jazz Suit out to Portobello beach: time to build some new connections with our current place.